This dessert was inspired by that old classic, key lime pie. Not being able to get hold of some of the critical ingredients (notably, key limes! 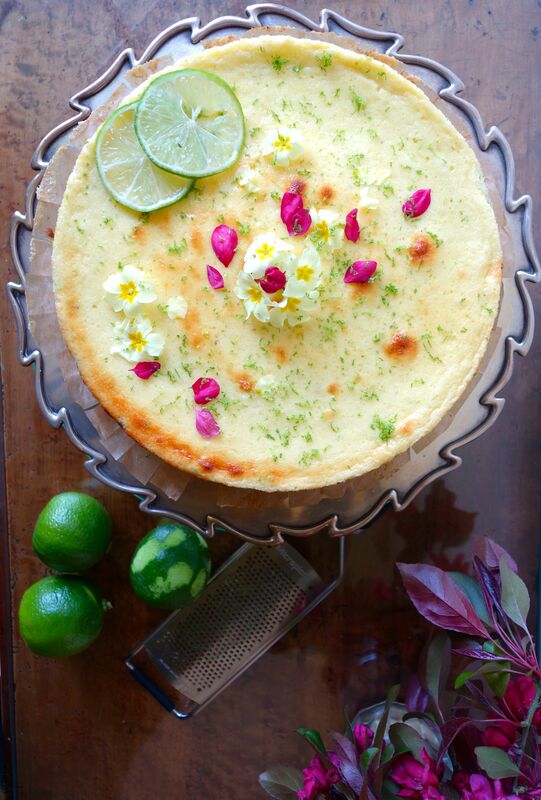 ), this has evolved into a slightly different take, in the form of a summery lime and mint dessert. A tip some American friends gave me was to add whipped egg white – this makes the texture lighter and fluffier compared with the traditional key lime pie. I’ve added a touch of tashkent mint because I love the combination of mint and lime (mojito, anyone?! ), but it also works well with just the lime on its own. If you really wanted to go to town, you could make the digestive biscuits from scratch too (there’s a recipe in “A Handful of Flour” for wholemeal and oat digestives, which are lighter in texture and less sweet than the shop-bought versions). I topped it with edible flowers from the garden, but these are purely for decoration. You could equally decorate with a few slices of fresh lime and some whipped cream, as an alternative. Line a 23cm loose bottom tart tin or spring form cake tin with greaseproof paper. Preheat your oven to 180°C. Crush the biscuits into a fine powder in a mixing bowl using a rolling pin (don’t leave any chunks). Stir in the melted butter, sugar, cinnamon and vanilla, and combine. Spread this evenly into the base of the tin, and up the sides to form the crust. Really press it down with your hands to create a firm base. Bake for 10-12 minutes until golden brown, then set aside to cool. Using an electric hand whisk, beat the condensed milk together with the egg yolks for 6 minutes, until thick and creamy. Add the lime zest and mint. Lastly, gradually pour in the lime juice, beating all the time. Beat the egg whites in a separate bowl until they form stiff peaks, then gently fold them into the mix using a spatula. Pour the mixture into the tart case, and bake for 25-30 minutes, or until set in the centre. Leave it to cool fully, and then refrigerate it for at least two hours before serving. Garnish with grated lime zest. This will keep for 2-3 days if stored in the fridge wrapped in cling film.